4G will support data rates of 1Gbps(Static) and 20-100Mbps to enable smooth running of applications. 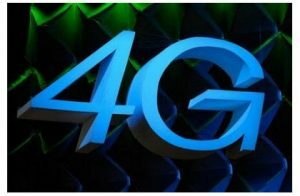 This article will tell you about 4G in details. The evolution chain of telecommunication standards started from 1G, better known as Analog communication, which was replaced by 2G networks in early 2000 when GSM and CDMA technologies helped upgrading the telecommunication standards from Analog to Digital. The urgent need of data communication caused the evolution of GPRS services(referred as 2.5G). But as GPRS services could not support high data rates and better QOS, the consumer market required an efficient, more advanced data-oriented telecom standard that would enable end users to use high-end mobile based applications such as Video tele-conferencing, High speed Internet, Live video streaming and similar other features. This led to the evolution of 3G Networks, which was Bandwidth efficient and could well support high data rates(384Mbps- 2Mbps) on the move. Today, 3G Networks are getting more commercial deployments than any of its preceding technologies and 3G services seem to be capturing the majority of the consumer market at the moment. But, as it’s a fact that evolution has to keep happening and limitations have to be stretched further, 3G services will soon be taken over by more advanced 4G Networks. 4G Networks are not a Happening Reality as of now. Although 4G standards have statistically been defined to an extent by telecom industry experts, the implementation is still to go beyond Test deployments(for experimental usage). Below are some of the major enhancements that 4G Networks will support, as soon as mass commercial deployment of 4G Networks takes off. 4G Networks will exclusively be IP based Networks, with Packet-switching as the only data switching technology. It is important to note that there will be no use of Circuit Switching in 4G, a data switching methodology, which is used in conjunction with Packet Switching in 3G Networks. 4G networks will support IP based Multimedia applications and provide the ability for users to roam across dissimilar networks. 4G technology is supposed to employ Concatenated FEC (Forward Error Correction) in its encoding methodologies, as a result of which, the average capacity of data packets to be transmitted will increase, along with a simultaneous reduction in BER(Bit Error Rate) during transmission. Such an enhancement will help increasing Network Throughput. Above advancements will lead to Higher bandwidth, which will result in cheap data transfer rates. Quality of Service as well as Network security will also be much better in case of 4G compared to its predecessors. More efficient algorithms at the Physical and Data layer will help reducing the Inter-channel Interference and Co-channel Interference. Low intereference will enhance QOS and consequently improve End user experience.